Since New Years is the time for do-lists, here’s ours—and it’s loaded with must-have experiences for Western garden fanatics. 1. 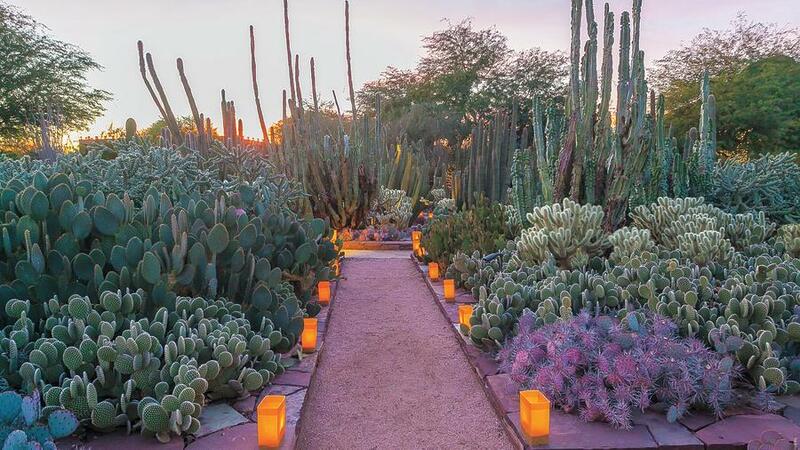 Meander along desert pathways by the light of nearly 8,000 hand-lit luminarias at the Desert Botanical Garden’s magical holiday event in Phoenix, AZ. 2. Pull your car off the highway and walk among the fields of California poppies growing wild along the Big Sur cliffs. 3. Taste the sweet, jelly-like fruit of the saguaro cactus in the South West. This is how you get your hands on one of these prickly specimens. 4. Walk among the cherry blossoms at Portland’s Japanese Garden in late February. 5. Marvel, perhaps for the hundredth time, at the glory of the redwoods. Because, really, they never cease to make one feel like a tiny, inconsequential speck on this earth. 6. See the rebar and bougainvillea trees at the Getty Center in L.A.
7. Take a boat trip out to Santa Barbara’s Channel Islands to see the native Coreopsis gigantea blanket the rocky islands with golden blooms. 8. Hunt for native carnivorous plants in the wild. The Oregon Coast and California’s Trinity Alps are good places to start. 9. See the only palms native to the west (California Fan Palms Washingtonia filifera) in a secluded desert oasis in Indian Canyons, CA. Cool off after your hike with an icy-cold date shake. 10. Visit the overgrown, bromeliad-covered car at Flora Grubb Garden, S.F. 11. Check out the blooming swaths of Echium (Pride of Madera) in spring and wonder at their 8-foot tall purple flower spikes. The coast of Monterey, CA by ‘Lover’s Point’ has a nice stretch of them. 12. Forget potatoes, try breadfruit (Ulu) fries in Hawaii at an ‘Ulu Cookoff’. 13. Moss-lovers, this is a must: Visit the Hoh Rainforest of the Washington’s Olympic Peninsula where the ground is literally carpeted in bright green. 14. At the Allerton garden in Kauai, walk among the towering Moreton Bay Figs—the very ones featured in Jurassic Park—and keep an eye out for velociraptor. 15. Catch the desert bloom outside Palm Springs, CA. For a few weeks a year, the arid hills are covered with wildflowers blooming their hearts out in the brief period between winter rains and summer’s scorching heat. What else? What would you add to our list?